For more than twenty-five years, the Weir-Jones/Terrascience Groups have supplied ice force monitoring systems to vessel owners, the operators of offshore platforms, and government agencies. The IDEAL™ family of ice force sensors ranges in size from the IDEAL™ panel to the Maxicell and the Microcell. The former may have an active area of 4m2 and are designed to be installed on fixed structures, such as offshore platforms in ice infested waters or fixed structures. A major installation of IDEAL™ panels is on the Confederation Bridge, which spans the Northumberland Strait between Prince Edward Island and New Brunswick in Eastern Canada. 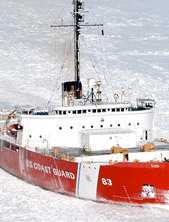 The Maxicell and Microcell, on the other hand, have much smaller active areas, .03m2 and .003m2 respectively, and were designed to be fitted to the bow plates of ice breakers and ice strengthened supply vessels where much higher ice loads are anticipated. All these devices are totally compatible with the data acquisition systems incorporated in HMON™ and VMON™.